The former British territory of Hong Kong is an autonomous Chinese territory made up of 260 peninsulas and islands in the South China Sea. This vibrant tourist hot spot doubles as a major global financial hub. Visitors will find an astonishing and complex cosmopolitan city with ancient temples and modern skyscrapers, while shopaholics will adore this high-end shopping mecca. The famed Temple Street Night Market offers a nearly unbelievable selection of desirable goods at a discount. As you explore all that Hong Kong has to offer, here are 25 accommodations that will make your stay one to remember. 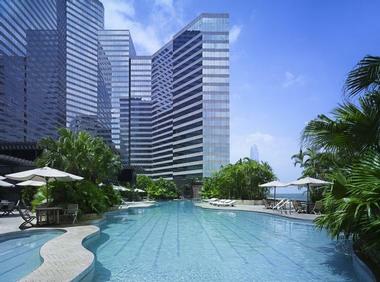 Recognized worldwide for its stellar, over-the-top properties, Four Seasons Hong Kong is no exception. Lavish guest rooms and suites with marble baths are available with Victoria Peak or harbor views on floors nine and above. The Presidential Suite, with a dedicated butler, includes a grand foyer, crystal chandelier, full kitchen, and massage room. Gourmet dining abounds, ranging from French offerings of artisanal cheese and wine to savory Chinese and Japanese cuisine to the Forbes 5-star Lung King Heem. Guests may enjoy afternoon tea, light snacks, or frozen drinks on the terrace while admiring the silver sculptures that adorn the pool. Other options include free tai chi lessons, guided chef tour, or a soothing spa visit. 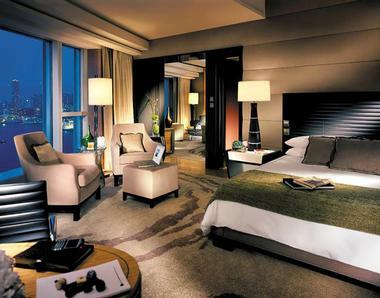 Conveniently connected to the convention center, the Grand Hyatt boasts an impressive 542 rooms and suites. Sophisticated shades of copper and ivory are found throughout these beautiful, airy accommodations, which overlook the tranquil harbor or garden. All palates will be satisfied by the nine onsite restaurants that include Chinese and Japanese cuisines and an Argentinian steakhouse. In addition to the heated outdoor pool and 24-hour gym, a jogging path runs through the property. Afternoon tea with a live dessert station is served on the delightful terrace. 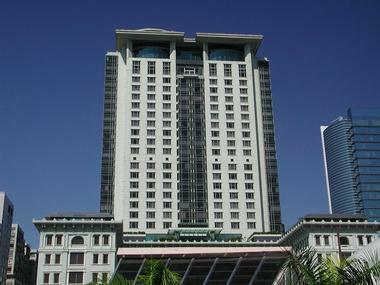 The Grand Ballroom and the other 22 event venues at the Grand Hyatt offer features such as fireplaces and arranged games of mahjong. 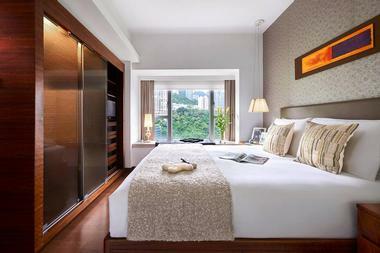 Hk Peace Guest House offers a pleasing alternative to the more expensive accommodations in Hong Kong. This economical and modest venue provides non-smoking, allergy-free rooms with climate control, basic toiletries, a small cable TV, and in-room safe. The single beds fit cozily against the wall. This property has a convenient elevator and 24-hour reception desk that can support currency exchanges. Although there are no dining options on-site, the helpful staff will provide many nearby recommendations. Other major points of interest, such as the Sky100 Hong Kong Observation Deck and Skyline, are in close proximity to this property, as is the MTR subway station. 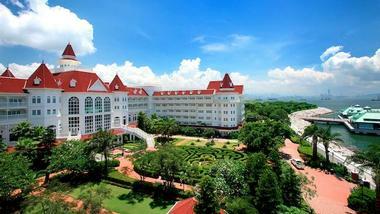 Hong Kong Disneyland Hotel offers standard, deluxe, sea view, or sea view with balcony rooms with connecting room options. Accommodations include limousine airport pick up, complimentary parking, Wi-Fi, and a refrigerator. Children will adore the Bibidi Bobbidi Boutique princess makeovers, character greetings, garden maze, kids’ activity center, and waterslide. Parent indulgent time may include poolside cocktails, live music in the hotel lobby, and a whirlpool sauna. All can meet Disney characters at the whimsical buffet in the Enchanted Garden. Childcare and Disney tour arrangements may be made for a fee. Other add-ons include access to the top floor Kingdom Club, themed room decoration packages, meal vouchers, and priority admittance to Hong Kong Disneyland. 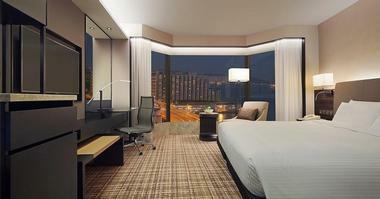 EAST, Hong Kong is a stylish, contemporary hotel located on Hong Kong Island. Rooms featuring marble, wood, and bamboo are available with king or queen-sized beds and are offered in urban view or harbor view, with corner unit options. Rooms include a Handy smartphone, free Wi-Fi, Apple TV or LCD TV, walk-in rain shower, and access to the brilliant blue pool for leisurely relaxation. Suite level accommodations include a complimentary minibar and a delightful “bubble” chair with wraparound windows. The hugely popular rooftop bar Sugar as well as Café Feast are perfect for casual BBQs or formal or elegant gatherings of up to 100 guests. Both boast superb harbor views. 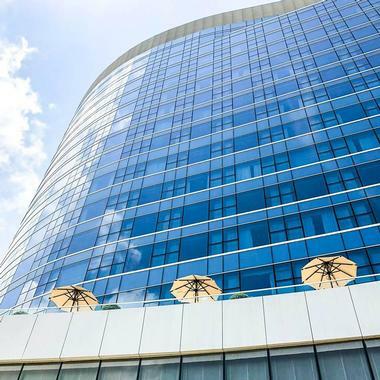 Situated near the Hong Kong Observation Wheel, the casually elegant City Garden offers 613 rooms and suites in levels Deluxe, Premiere, Signature, Grand Luxe, and City Suite. All rooms include an LCD TV, free airport express shuttle bus, Wi-Fi, and use of a Handy smartphone. Club Level rooms provide a sense of exclusivity, with daily complimentary breakfast buffets and evening cocktails. Gourmet dining can be found in the award-winning YUE for Cantonese cuisine, while the mystical Satay Inn features Singaporean delicacies. For more casual nibbles, the Garden Café offers an all-day buffet. The relaxing pool, heated outdoor Jacuzzi, and 24-hour gym with floor-to-ceiling windows are open to all guests. Awarded Best in Travel 2017 Smart Asia, this treasure is conveniently located in the heart of the vibrant business district directly above a high-end shopping complex and movie theater. Guest rooms and suites awash in mocha, chocolate, and cream colors are available in three price tiers and 15 styles. All feature gorgeous views and are equipped with Wi-Fi, marble bathrooms, deep soak tubs, pillow menus, blackout curtains, and minibars. All guests may luxuriate in the on-site spa treatments, heated outdoor pool, and 24-hour gym. Twelve meeting rooms, including the Grand Ballroom, can support up to 1,000 participants. Fine dining is offered at Nicholinis, Cantonese Golden Leaf, and the elegant poolside café. 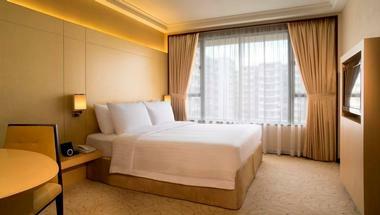 The hospitable and relaxed Hotel Jen is located in Hong Kong’s Western district. Accommodations include superior, deluxe city view and deluxe harbor view options. All rooms feature a charming padded window bench, cable TV, complimentary Wi-Fi, and coffee station. A free shuttle to nearby attractions, access to the lovely rooftop pool, and a 24-hour gym are added perks. Café Malacca provides a casual atmosphere for sampling gourmet treats from Malaysia and Singapore. Club level members may take advantage of complimentary daily breakfast and evening cocktails. At the all-day dining buffet, children under the age of six eat free of charge. Hotel Jen is idyllic for intimate weddings or other events for up to 60 people. This hip, chic hotel is focused on promoting local talent by showcasing artwork throughout the property and hosting events featuring state-of-the-art technology. The minimalistic decor of light gray, charcoal black, and light wood in the superior, deluxe, and suite rooms is a welcome contrast to the chaotic, busy streets of Hong Kong. Amenity options include eco-massage showerheads, privacy panels, remote control lights, fully loaded multi-media devices, full-length windows, and Nespresso machines. Long-term service packages are available. Located in Kowloon’s commercial district, Hotel Stage is ideally situated in close proximity to the MTR, Jade Market, and Tin Hau temple. 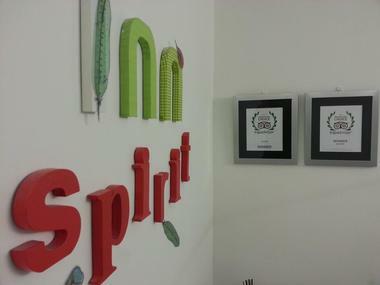 The award-winning Innspirit is a cozy and unpretentious guesthouse. 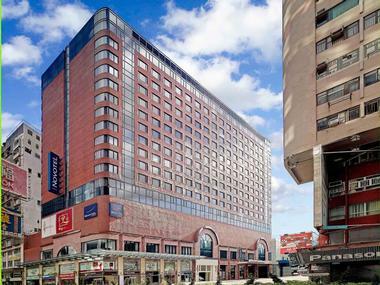 It’s conveniently located near endless shops, cafés, restaurants and entertainment. Innspirit, in Tsim Sha Tsui, is just a one-minute walk from the MRT and provides an excellent, affordable option for budget-conscious travelers. Rooms furnished with basic toiletries are available in a standard double bed style with a maximum capacity of two guests. The twin with bunkbed option can accommodate three people. 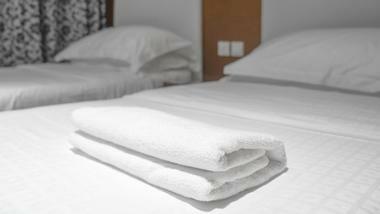 Rooms feature en suites, microwaves, towels, linens, free Wi-Fi, and a small TV. A popular nearby attraction is the Symphony of Lights, a charming local light show that is presented nightly. This polished Forbes five-star property is nothing short of spectacular. Close to many major attractions on the Kowloon waterfront, the InterContinental proudly offers 500 guestrooms, with the option of Club Level upgrade. Bathed in luxurious golds, coppers, and maroons, the elite Presidential Suite boasts 7,000 square feet, gorgeous harbor views, a private terrace, and Jacuzzi. Exquisite dining from casually elegant to over-the-top is found at several on-site restaurants, including the award-winning Yan Toh Heen. Eleven meeting rooms are available for galas, weddings, and other events. Guests may also stroll outside to find inexpensive food stalls, or embark on a concierge-arranged harbor cruise. 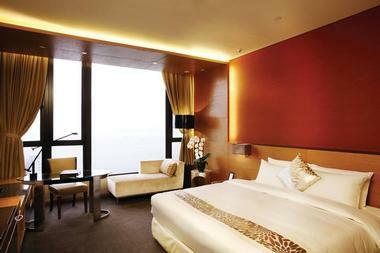 With its 546 waterfront guestrooms offered in eight levels, visitors are spoiled for choice. Dazzling views of the harbor and skyline abound. Suite level rooms and above include a complimentary minibar, kitchenette, full-length windows, and club access, which provides daily breakfast, all-day snacks, and evening cocktails. Kerry Hotel offers an e-concierge service, Handy smartphone, and Wi-Fi to all guests. Also available are an in-house doctor, childcare, IT butler, shoeshine service, and florist. Brilliant dining options include everything from the laidback Dockyard food hall to gourmet cuisine. The magnificent on-site art collection, infinity spa pool, and tasty libations at the Red Sugar lounge are huge favorites. Kowloon Shangri-La awes guests with its massive lobby fountain and glittery crystal chandelier from the moment of their arrival. Guest accommodations include categories from the Deluxe Horizon Club to the 2,422-square-foot Presidential Suite with floor-to-ceiling bay windows. All are superbly decorated with enticing colors and stylish furniture. They include Italian marble bathrooms, use of smartphones, and free Wi-Fi. Nadaman, Angelini, and Shang Palace offer international gourmet delights, and guests will find that the Tapas Bar and Lobby Lounge are the perfect accompaniments to a sublime culinary journey. For added guest convenience, a florist, babysitting service, medical doctor, and shuttle are on hand. 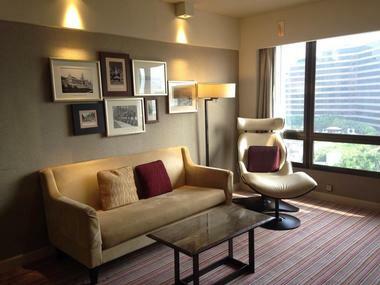 At L’Hotel Nina, 1,608 glamorous guestrooms and suites await in the twin towers of the largest hotel in Tsuen Wan, Hong Kong. Individually decorated, these beautiful accommodations are ideally situated next to a gigantic shopping mall. Included in each room is complimentary Wi-Fi and an airport shuttle. Café Circles tempts appetites with Asian and international cuisine and offers stunning city and water views. Staffed with professional chefs, Restaurant RU provides exceptional Asian delights, including crowd-pleasing dim sum. Both of these venues provide a sophisticated location for events or weddings. Those in search of tranquil waters may dip into the Olympic-size pool or visit the serene lotus pond. 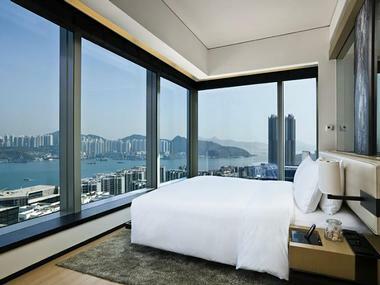 The recently renovated and upgraded Marco Polo Hongkong Hotel offers 665 premium guestrooms and suites with harbor, garden, and skyline options. The elite Marco Polo Suite features in-room dining, movies, mini-bar, dressing room, walk-in closet, Handy smartphone, club access, iHome docking station, and interconnecting rooms. The special Piccolo Kids Club provides gifts during turndown service and surprises such as decorated eating utensils for the little ones. Buffet or a la carte choice is offered at Café Marco. Cucina is tailor-made for Italian food aficionados, while the Lobby Lounge is a superior spot for afternoon tea and cocktails. 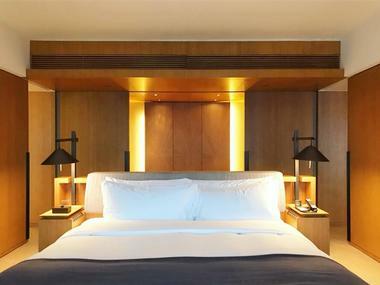 A visual feast of vibrant colors and sophistication grace the 464 guestrooms and suites of this five-star luxury hotel. Conveniently located 5 minutes from the MTR, guests may select king or queen-size beds for ultimate comfort and enjoy scenic cityscape or harbor views below. Those opting for the Residence Club level receive a welcome fruit basket, complimentary daily breakfast, newspaper, and evening cocktails. The suite level includes a Jacuzzi and home theater. Culinary choices range from casual to formal, including Cantonese and French, and the lounge provides light snacks. The pristine rooftop pool and business center are available to all guests. 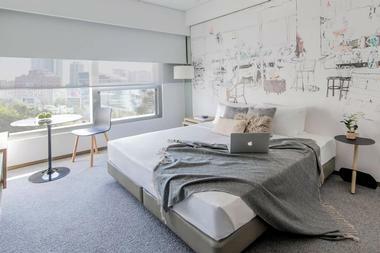 Nestled along busy Nathan Road, and within steps of the night market, Novotel guestrooms and suites offer tasteful, clean-line furniture, white linens, and cheerful accent colors. Four categories of rooms are available to accommodate all guests’ needs and come fully stocked with complimentary Wi-Fi, LCD TVs, minibars, and coffeemakers. The luxury option with king or two single beds plus a sofa bed is ideally suited for families. The suite and executive levels qualify for Club Lounge access. To satisfy all palates, daily buffet breakfast, lunch, and dinner are found in the casual SQUARE restaurant, offering Asian and international fare. All of the Park Hotel’s soothing guestrooms and suites offer complimentary two-way airport shuttle, smartphone, minibar, and coffeemaker. These accommodations, which range from 40 to 64 square meters (430 to 700 square feet) in size, also include access to the fitness center and provide a respite from the bustling, energetic cityscape below. The Deluxe Suite boasts a divine soaking tub and separate living and bedroom. Guests may leisurely sip spirits or engage in lively conversation at the onsite Marigold Bar before savoring international fare at the Park Café. The event facility is a wonderful choice for intimate celebrations and small weddings, complete with plated full-course Cantonese or Western-style buffet options. Shama is an offbeat and chic serviced apartment venue located on lively Peel Street. Bright colors and eclectic, contemporary furnishings are found throughout the stylish 56 rooms, which include kitchenettes, DVD players, and LCD TVs. Room sizes range from 45 to 186 square meters (480 to 2,000 square feet) and are offered in categories like studio, one, luxury one, two bedroom, and penthouse. The penthouse includes a king bed, master bedroom, and separate living and dining areas. Services include bi-weekly towel and linen change, five-day-a-week maid service, DVD and games library, business center, and concierge. Included in the apartment rental is a unique neighborhood orientation and introductory tour. 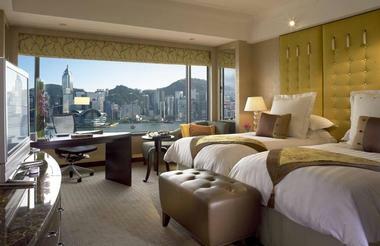 Sleek, classic lines define the world-class 782 rooms and suites at the Sheraton Hong Kong. Accommodations are available from 205 to 1,647 square feet, from the 205-square-foot superior room to the 1,647-square-foot penthouse, which features plush sofas, armchairs, kitchenette, docking station, private sauna, and lounge access. Free Wi-Fi, marble floors, glass vanities, and dual massage showerheads are standard in each room, and everyone may use the rooftop pool, with its three Jacuzzis, and the jogging course. Guests may feast on cuisine from China and Japan or shuck delicacies at the Oyster and Wine bar. Those with smaller appetites will find international small plates in the lobby lounge and flavorful concoctions at the Sky Lounge. 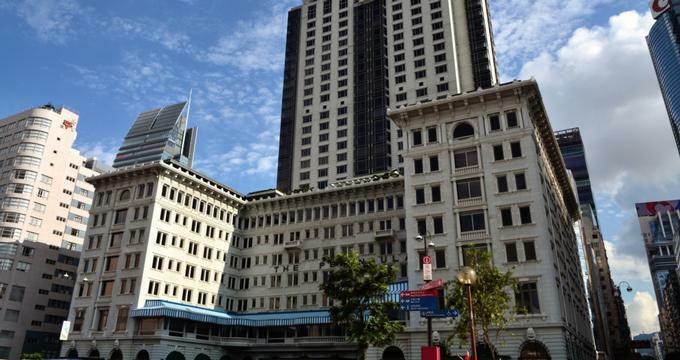 The Langham has proudly graced the Hong Kong skyline since 1865. Nine levels of rooms are available at this property, with a distinctive European influence. The ultimate Chairman Suite includes a pillow menu, fireplace, exquisite dining room set for six, silk upholstery, classic art pieces, and crystal chandeliers. Perfectly crafted and presented meals are provided courtesy of the Supper Club, including dim sum, poached fresh shrimp, and savory pan-seared ribeye. Visitors to the Chuan Body and Soul Spa will be pampered with a full menu of treatments. 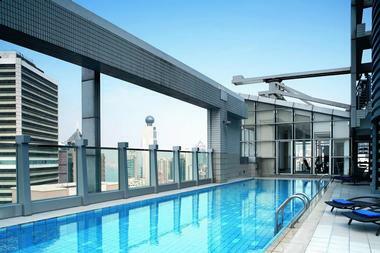 Guests will also enjoy the dazzling rooftop pool with gorgeous views. Aptly named the “Grande Dame of the Far East,” the regal Peninsula has 90 years of refined hospitality experience. The feather in its cap is its legendary fleet of 14 extended wheelbase Rolls-Royce Phantoms, available for rental by guests. 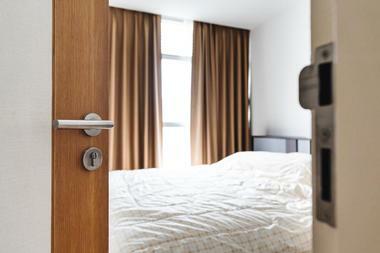 Accommodations come in eleven styles, sizes, and view options. 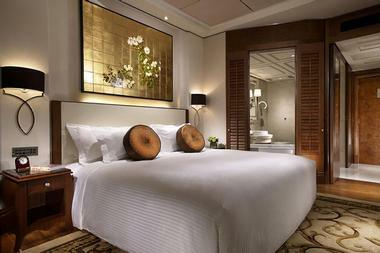 Guests may choose from deluxe rooms of 41 square feet to the ultimate 4,111-square-foot Peninsula Suite. 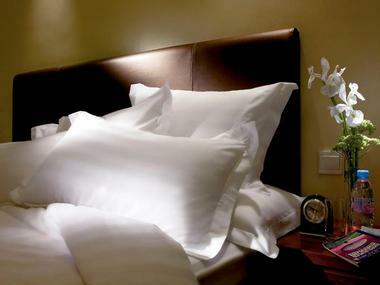 Large windows, marble countertops, bathroom TVs, high ceilings, and plush down duvets are found in every room. Bedside and desk tablets are available in eleven languages. A decadent spa and shimmering pool await. Afternoon tea, seven premier restaurants, an on-site pastry chef, and a chocolatier combine to provide unrivaled culinary pleasures. T is for training, and this unique hotel serves as a vocational training ground for students. Situated on Hong Kong Island, The T offers 30 guestrooms and suites featuring floor-to-ceiling windows, complimentary Wi-Fi, flat-screen TVs, bathroom TVs, minibars, and full baths. Wall-to-wall carpeting and attractive views are found throughout the T. Suites offer corner bedrooms, full kitchenettes, and views of the South China Sea or the western shore of Hong Kong Island. European dishes are offered from the Training Restaurant, while the Sky Lounge provides a relaxing place to sip favorite drinks or a frothy cappuccino. An oasis for the body and mind can be found at the Training Spa. The Upper House is a casual hotel providing 117 progressive levels of studios and suites to accommodate individual guest’s needs. They range from 68 to 1,230 square feet, while the penthouse boasts 1,960 square feet. Most rooms have fascinating artwork, decorative fixtures, large wraparound windows, LCD TVs, IPTV, wine fridges, complimentary maxi-bars, and espresso machines. Two bicycles are free to use, and the gym is open 24 hours. Special picnics, libations, or nibbles are available on the lawn. Free yoga classes are offered on the weekend. Guests will find relaxation at the special Sky Lounge, which offers amazing views and delectable bites from the acclaimed Café Grey. In-room dining is also available. 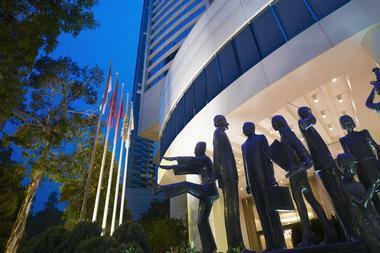 The captivating Wharney Guang Dong Hotel is located in close proximity to the Arts Center. 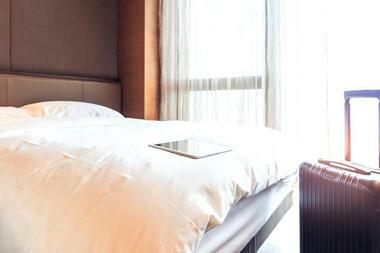 Complimentary room amenities include Wi-Fi, smart TV, bathroom phone, minibar, and a USB charging port. 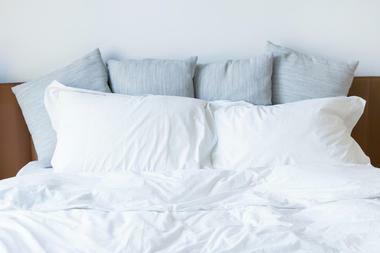 Silk bed runners, heavenly bedding, and subtle accents of color complement each room. Top tier rooms include Lounge 1991 access, complimentary breakfast, snacks, and cocktails. Complimentary hotel amenities include a free shuttle service, gym, and pool access. The 7th Son restaurant offers authentic Chinese and Cantonese delicacies. Fine Japanese fare is found at Ginza Kaguraya. Fans of Scotland will be in heaven at Hong Kong’s only Scottish bar, The Canny Man, with 180 single malts and 28 artisan beers.